$31.50 Out of stock. Email me when new stock arrives. We're a big fan of the Omni Deck (in fact, we have our own Phantom Deck), and now World Magic Shop have added an extra climax with the Omni Pen. In effect, first the deck turns clear, and then the pen turns clear, too. 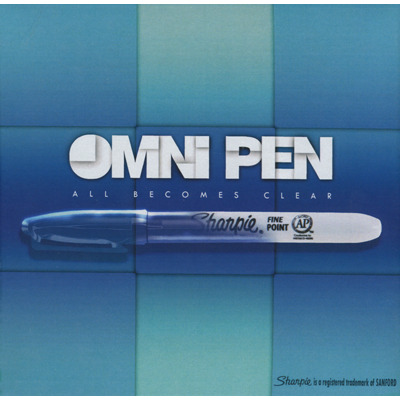 An Omni Pen is a perfectly clear pen that has been custom molded from clear, scratch-resistant acrylic. 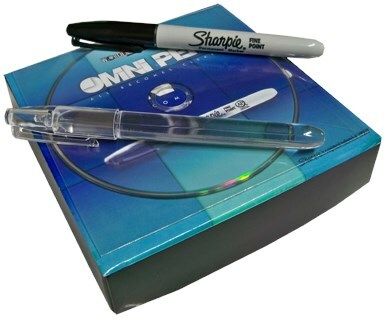 It is completely interchangeable with a normal Sharpie so that a normal Sharpie cap will fit on the Omni Pen and vice versa. If you already use an Omni Deck or a Phantom Deck, the Omni Pen provides you with a logical kicker to this already commercial presentation. Spencer invites the spectators to sign a card prior to performing his favourite card routine. First the deck goes clear, and in a logical kicker, the pen they signed the card with also goes clear, even though they have been holding onto it throughout the entire routine. First the top vanishes before being found on the spectators own hand! Then the body of the pen vanishes and reappears. Finally the cap becomes clear in the spectator's own hand prior to the colour being visually dragged off the pen. Inspired by Greg Wilson, Craig presents 'Sharp' direct from his number one set with the super commercial 'OMNI PEN' double kicker.